On route there were traffic jams caused by accidents, and we got stuck behind an extremely slow lorry on a small mountain road (the driver was doing something on their phone while driving), so it took us around 3 hours to get there in the end. 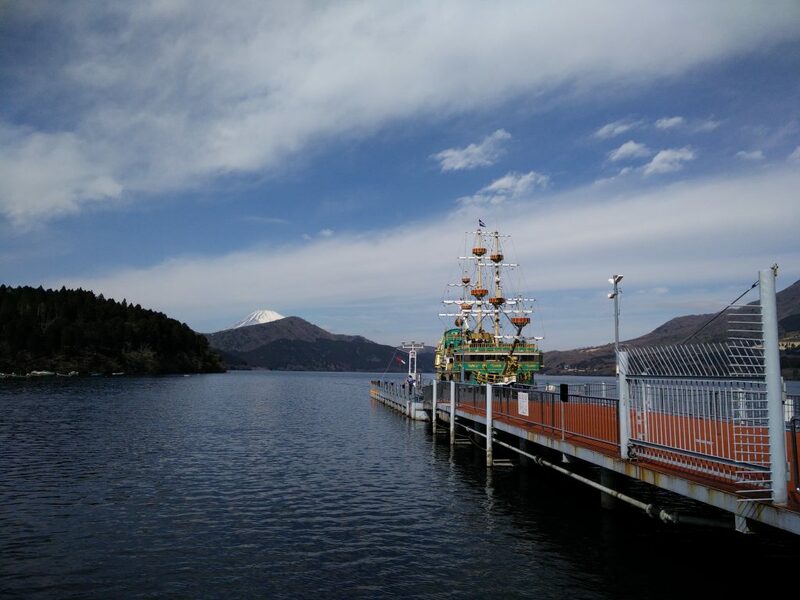 Our first plan upon arriving at Hakone was the Hakone “pirate ship”. However, being 1 hour later than planned, even the teachers didn’t know whether we could still ride it. In a lucky turn off events we arrived at the port just as the ship was pulling in, so we just managed to ride it. Rather than just being a normal ferry, this ship was built to look like an old sailboat like its name suggests. It was a little bit cheap looking, and rather touristy, but we got a really good view of the stunning scenery and Mt. Fuji while riding it. Also managed to take some nice photos. After that we ate lunch, then split into two groups, onsen course and sightseeing course. I was in the sightseeing group. First we took the cable car up the mountain to the Ōwakudani valley. It is known as “the valley of hell” and when you arrive it is easy to see why. The yellowish green rocks everywhere, the trees and other plants covered in a white substance, thick white steam coming out the ground and the strange smell in the air. This is due to the area being an active volcano. There are lots of sulphur rich rocks, creating that smell, and steam due to the volcanic activity. It was my first time going anywhere like that. It was amazing. Wherever you go in Japan there are meibutsu, special food or drink associated with that region or place. 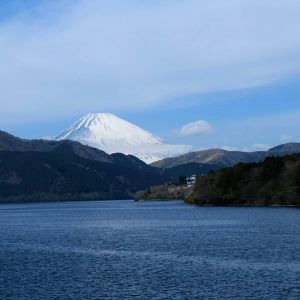 For example, Tokushima prefecture’s meibutsu is Sudachi (a kind of fruit similar to a Lime), Nagoya’s is Uiro (a kind of sweet not dissimilar to mochi) or Hitsumabushi (a dish with grilled eel over rice). Ōwakudani’s is Black eggs. The eggs shells turn black due to them being boiled in sulphur rich water. It is said that eating one of the black eggs will extend your life by seven years. Also, according to a leaflet in the souvenir shop, the black eggs have more flavour and nutrient value than normal eggs. They sell the black eggs in packs of five there, so I bought one with my classmates and we all tried one. But, it was just the same taste as a normal egg. I was a little disappointed. Hopefully it at least extends my life by seven years. 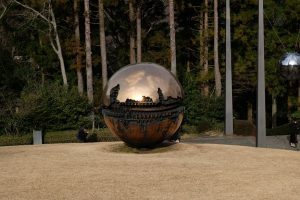 Lastly, we went to The Hakone Open-Air Art Museum. They had lots of sculptures outside, and the weather was good. It was really interesting. But it did make me feel like I wanted to be a kid again. There were lots of places for kids to play in, and it looked really good fun. I also wanted to play inside a sculpture, but there were various age limits (e.g. 6yrs old or under). The only thing an adult could go in was a stained glass tower. Besides the outside part, there was also a Picasso exhibit. I saw some sculptures and crockery that Picasso had done for the first time, so I learned something new. Then we got the bus back to Tokyo. Among one of my friends acquaintance, there is a guy that imports wine from California. He holds events to sell wine around once a month. My friend helps out at these events as a part time job, and I was invited along to see how it works for the February event. It was a really good experience. 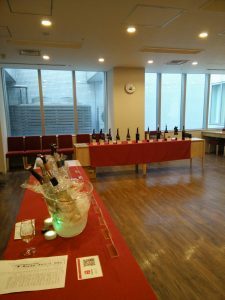 At the event, there were 8 white wines, one rose, and around 12 red wines set out on the table. And the customers could try the wines they were interested in, then fill out an order form once they decided which to buy. I arrived in the half time break. To start with I tried all the wines, read an information sheet (really for the customers) and copied my friend’s notes on the wines. After around 15 mins, customers started arriving. Even though I know very little about wine, I was soon behind the table serving wine and answering questions. Had a lot of conversations with the customers. Obviously all in Japanese. On my name badge, I wrote that I am from Scotland so I got a lot of questions on why I can speak Japanese, why I came to Japan, and about Scotland and the Uk as well as about wine. It made me notice that my Japanese level has improved. I still don’t feel confident answering questions about wine, but it was super interesting listening to the people working at the event talking about it. They talked with such enthusiasm, knew lots of little facts, and used words in a way that made you want to hear more. I know I still have a long way to go, but I hope that someday I will be able to talk like that. When graduating from University, Japanese people often wear Hakama, an item of clothing similar to a skirt worn over a Kimono to the ceremony. I think it’s an extremely beautiful thing. When I saw my friends stunning graduation photos, I hoped that one day I could also wear one. I was really fortunate to get a chance to wear one recently. My Japanese language school owns around 10 Hakama for both genders. And when students on a student visa graduate they hold an event to wear them and take graduation photos. So of course I did it. We were able to pick our preferred colour from the kimono that school owned. I got there a little early, so I got to pick first and chose a pretty blue and purple one (which I think was the best). 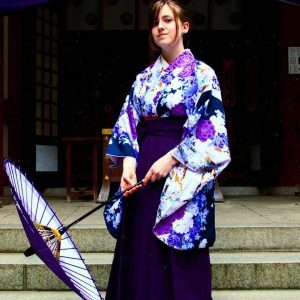 And a dark purple Hakama to go with it. Then two of the teachers helped everyone get dressed, tied the obi’s etc. The kind that we wore was a slightly simplified version, but even so it took a while to get changed. Normally beneath the Kimono you wear a white undershirt but we just wore the visible white collar part, and my classmates just wore it over their normal clothes. I changed into a traditional underwear because I was wearing a bulky skirt though. When everyone had changed (there were the five of us from my class, plus two girls from the class below us), we took photos one by one in the school’s Japanese style tea room (a tatami room), then some group photos. Before heading out to a local shrine because it was good weather. It was actually really hard to walk in the Hakama. Because you can’t move your legs much, rather than normal steps you have to take lots of really small steps. It was pretty tough using stairs, or even stepping up onto the pavement from the road. Also, due to the obi being tied really tight, it was a little hard to breathe. At the shrine, we took more photos holding umbrellas. 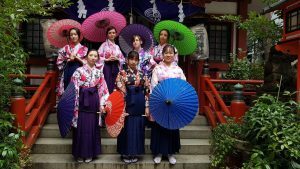 The bright colours of the Hakama and the umbrellas, with the bright red of the shrine made for eye-catching photos. Once back at school, my classmates and I took more photos on our phones and enjoyed wearing the Hakama. I’m really glad I got the chance to make this kind of memory with everyone, I had a great time.